Guys! I don't know how excited you are for Kingdom Hearts 3D: Dream Drop Distance, but if you're not then you should be. A TON of news was released today. In addition to the Hunchback of Notre Dame world, there's going to be a Pinocchio world called Prankster's Paradise, a Tron Legacy world, and the Mickey movie the Three Musketeers. Also, Axel (KH2), young Terranort (KH:BbS), Vanitas (KH: BbS), Xion (KH: 358/2 Days), Roxas, Joshua (TWEWY), Rhyme (TWEWY), Beat (TWEWY), and Shiki (TWEWY) will also appear! Axel is also going by his real name (Lea) so maybe he's been turned back into a human? The Beagle Boys also show up in the Musketeer World. BAH! I always meant to make Kingdom Hearts General but procrastinated too much. I wanted to have a big fancy, showy first post like I did with the DBZ thread, hahaha. Okay, sooooo yeah, I'm a MASSIVE fan of the Kingdom Hearts series. Some of the side games I was admittedly more than okay with skipping over, but I absolutely adore the series as a whole, and a lot of that is because of how captivated I was with it as a kid. I remember in middleschool seeing a big article about it in Gameinformer but sort of skipped over it thinking it was just some Disney game, (keep in mind I had no idea what FF or Squaresoft was prior to playing KH. My best friend whom I made in Middle School introduced me to the PSX FF games after we started getting to know each other more,) but after seeing the TV Spot and hearing Utada's awesome music over those scenes I was immediately blown away. You have no idea how enthralled with it I was. Growing up with games like SMRPG and the Zelda series and such I was always obsessed with epics and adventure stories as a youngster, and this made it clear from one short commercial it would be an adventure more mind-blowing than anything I've ever played. That feeling stuck with me from beginning to end. From Destiny Island to Traverse Town to the Colliseum, (still my favorite arena side-game of the series thus far, didn't care much for KH2's...) to Hollow Bastion and so on... Oh, and don't even get me started on the events at Hollow Bastion, oh man... The events with Sora and Riku, the fights between the two, Sora's reuniting with Kairi, it really is impossible to explain just how much I loved the game. Even things most people tend to hate on, like Nomura's character designs and convoluted story telling, things like those made it even more captivating to me. I could keep going forever about the first game but would rather keep this from being too long... So anyways you can understand that I was crazy excited for Kingdom Hearts II, played it and loved it, (though not as much as the first Kingdom Hearts, obviously... My personal hype and obsession for that game set the bar in my mind far too high,) though Roxas annoyed me to no end, even moreso when this small sub-fanbase of people started popping up who played KH2 without touching the first, think Org. XIII is just the coolest thing since Fonzie and are crazy about Roxas and such. Oh, and as nostalgic as Simple and Clean is I love Sanctuary a bit more. So anywhoo I skipped over COM and the DS games, and almost missed out on BBS due to my hate for UMDs but I sucked it up and bought it, played through Ventus' story, (maybe not as annoying as Roxas, but still just a pussified version of Sora,) and still gotta get around to the other characters and such. Okay, so blah blah blah, rambling is over. Not like anyone is gonna read all of this anyways. Love Kingdom Hearts, love Sora, love Utada and Shimomura, nostalgia dial turned to 11, and I love Nomura. THAT'S RIGHT I SAID IT. It's all had a huge affect on my writing and, (to a much lesser extent,) character designs as well. Can't wait for 3D, and can't wait for KH3. Last edited by Seven Rain on January 6th, 2012, 8:03 am, edited 5 times in total. tveye wrote: Guys! 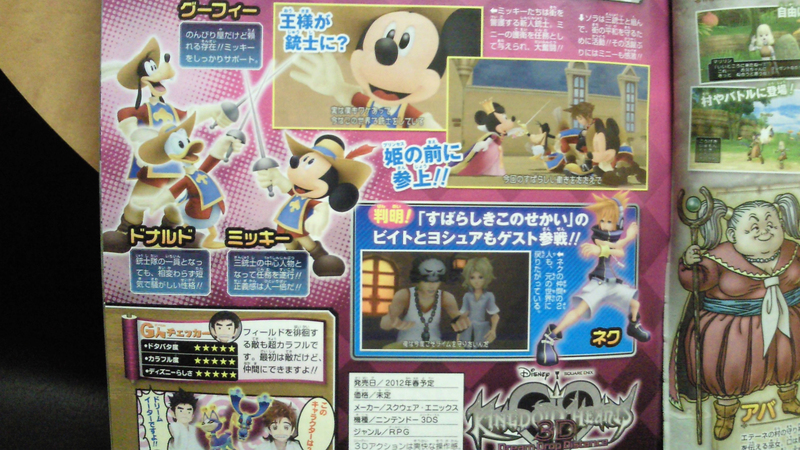 I don't know how excited you are for Kingdom Hearts 3D: Dream Drop Distance, but if you're not then you should be. A TON of news was released today. In addition to the Hunchback of Notre Dame world, there's going to be a Pinocchio world called Prankster's Paradise, a Tron Legacy world, and the Mickey movie the Three Musketeers. Wow, I hadn't heard about any of this. I imagine it'll be incredibly difficult for me to follow the story though, but oh well, it's not like I can play the originals anyway. Seven Rain wrote: Okay, so blah blah blah, rambling is over. Not like anyone is gonna read all of this anyways. WRONG! Your experience is similar to mine. I was 10 when I first heard about Kingdom Hearts...pretty sure I was already 11 or 12 when it came out. But, yeah. Later when the game was released, the commercial with Simple and Clean was...so amazing. I was like, "NIGHTMARE BEFORE CHRISTMAS? TARZAN? WHAT?!?!?!" Anyways, I own EVERY KH game except for Coded. I beaten them all as well and I have to say Birth By Sleep is my favorite. Ahaha, well I'm glad another big fan was the one to make the thread then. SAME HERE! Although I got into the series backwards. I heard about Kingdom Hearts via Chain of Memories. The commercial with Utada and Chain of Memories is what got me into the story. I didn't know what was going on when I first played, mainly because that entire game is a backwards memory lane. Where half of it is true and half of it isn't. I didn't even know who Kairi was (I replayed it after playing KH so I understood it). But yeah, I really loved the style, believe it or not. The combat was interesting for someone like me who liked being tactical. Then I went onto play KH, loved that, borrowed my brother's PS2 for KH2, and the rest is history. Man I can't wait for KH3D! I was eccstatic for the awesome gameplay and new worlds, but after hearing Xion...oh man. This went from a day one purchase to a possible midnight launch...ALL OF MY TIME. I absolutely can't wait. @Seven Rain: You're not missing anything by not playing CoM, they pretty much "explain" what happens during 358/2 Days. You can probably skip that one too, it's only the story on how Roxas came to gain his power and how the other nobodies acted during the course between KH1 and the beginning of KH2. It's really only an explanation of Roxas (and Xion) ( ) so I'm sure you don't want to play that haha. Re:Coded though was pretty damn fun. The story was kind of iffy, and its kind of an interesting little "here's why Mickey sent the letter to Sora at the end of KH2" explanation thing, but I really liked it for its gameplay. It took the awesome command style of BBS, made the leveling and ability system very interesting, and added in a special Keyblade leveling thing for different playstyles. It was very cool. If you find it in a bargain bin, pick it up. Definitely a lot of fun. I'll keep that in mind. I was a bit interested in Re:Coded but decided against it due to the D-Pad... If I get a KH craving after my fill of BBS and 3D I might try to get it sometime. It'd probably be a lot more fun with the analog stick... The only thing that worries me is KH3D spoiling me with it's controls/gameplay/graphics/etc. it might make it pretty hard to play Re:Coded. Afrohawkman wrote: Man I can't wait for KH3D! I was eccstatic for the awesome gameplay and new worlds, but after hearing Xion...oh man. This went from a day one purchase to a possible midnight launch...ALL OF MY TIME. I absolutely can't wait. I know! I don't understand why a large majority of the fanbase hates on Xion. Probably because she was a possible love interest to Roxas and EVERYBODY KNOWS that Roxas is supposed to be with Axel hurr durr. Oh, apparently Dream Drop Distance will get its own original song theme. Tell me when Kingdom Hearts 3 comes out on a console. I'm getting tired of all these side games. Location: Somewhere over the proverbial rainbow. KirbyHead wrote: Tell me when Kingdom Hearts 3 comes out on a console. I'm getting tired of all these side games. Oh, so you'd rather have KH 3 be a rushed game and have it turn out like crap as a result of being rushed. I'm getting tired of all of these complaints about the side games. DISNEY X SQUARE?! SHUT UP AND TAKE MY MONEY. Ive never played Kingdom Hearts. Well, except Re: Coded. I found it extremely boring, even if Mickey was being a total badass.